Interested in exhibiting at this years Cleaning Expo UK at Naec Stoneleigh ? Get in touch with our sales team TODAY!! See and try all of the very latest and innovative products from most major manufacturers here at the Expo. With experts from every field in the industry displaying their products take advantage of their knowledge. Amazing savings are made every year by taking advantage of many on the day exlusive Expo only offers. Meet up with friends from social media and build new relationships with the suppliers & manufacturers face to face. 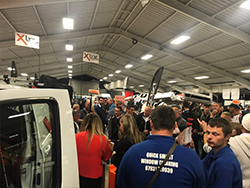 The Cleaning Expo UK is here in the Midlands for 2019 on September 7th at the NAEC at Stoneleigh Park in Warwickshire for the third time. The NAEC has the reputation of being one of the best conference / exhibition centres in the UK and all agreed that it was our best venue to date. The show is also indoors at this venue inside one of Stoneleigh's excellent exhibition halls. Now an established event for the cleaning industry the Cleaning Expo UK show aims to bring suppliers and manufacturers from many sectors together under one roof from small equipment suppliers to the largest and best known manufacturers in the industry. There are many more vendors and demos than ever before making this show "THE" go to event for anyone planning on purchasing new equipment or wanting to see the latest innovations up close and personal, to see how they work and decide if they really can help their business. Whilst you're here you can meet up with and talk to other like minded people, the guys and girls you've chatted to on facebook or forums or maybe pick the brains of an industry expert. 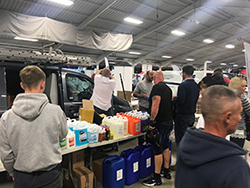 There are always bargains to be had at the WCP cleaning show too from virtually every exhibitor, savings on smaller essentials to huge only on the day discounts on major equipment. We like to keep it a family affair too and as usual KIDS ARE ALLOWED INTO THE EXPO & GO FREE so there is no excuse not to bring the whole family including mans best friend because the NAEC is dog friendly. The expo is open from 10am up until 5pm giving you plenty of time to browse, chat and try out everything you're interested in and also don't forget that many visitors book onto the show site or into local hotels giving themselves lots of time to socialise even more with friends and network in even more relaxed surroundings like the site bar. The Expo Gets Bigger Every Year. With more suppliers, manufacturers and services from all areas of the industry exhibiting every year the Expo is 'THE' go to show in the UK. Still have a question about the Expo ?